In addition to existing benefits such as scenic beauty, biodiversity, water quality, and recreation opportunities, our region’s heavily forested landscape stores a significant amount of carbon. The USDA Forest Service Forest Inventory Data Online (FIDO) EVALIDator 4.01 tool estimates the total amount of carbon currently stored in Western North Carolina to be 240 million tons. 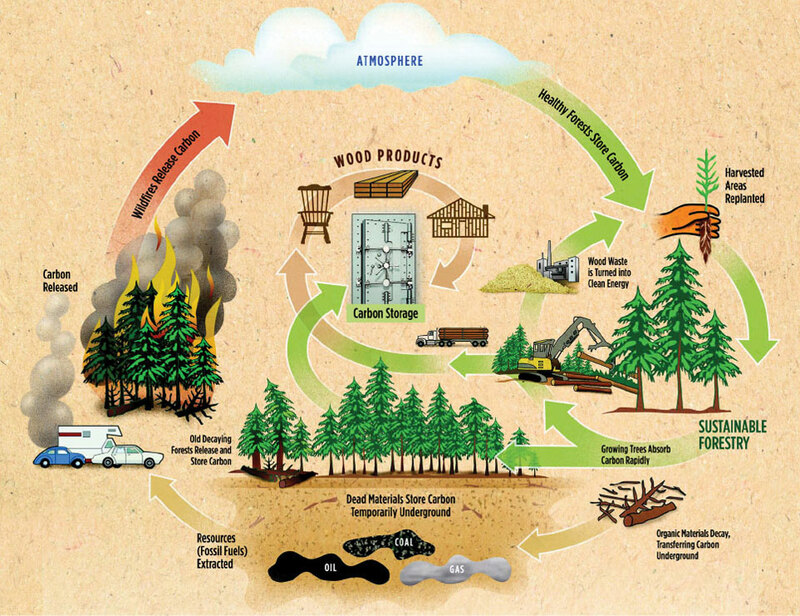 Carbon is primarily stored in live trees (58 percent), followed by soil (31 percent ). Under normal growing season conditions, the process of photosynthesis leads to an increase in the amount of carbon stored in forests, while metabolic changes (respiration, decomposition) and physical changes (wildfire, harvest, insects, and disease) decrease this amount. Moreover, the rate of carbon accumulation varies significantly with forest age, type, location, soil type and depth, as well as leafy and wood biomass. Because the rate of growth in young forests is relatively high, carbon accumulates quickly in the first several decades. However, as a forest matures, such as the forests here in Western North Carolina, the rate of growth slows and the ability to sequester new carbon declines and eventually falls off precipitously. The predominant forest type in Western North Carolina is upland hardwoods. After these forests surpass 80 years of age, the trees are more likely to lose vigor and the ability to uptake carbon from the atmosphere. This loss in vigor also drives the incentive to harvest trees while they are at peak market value. 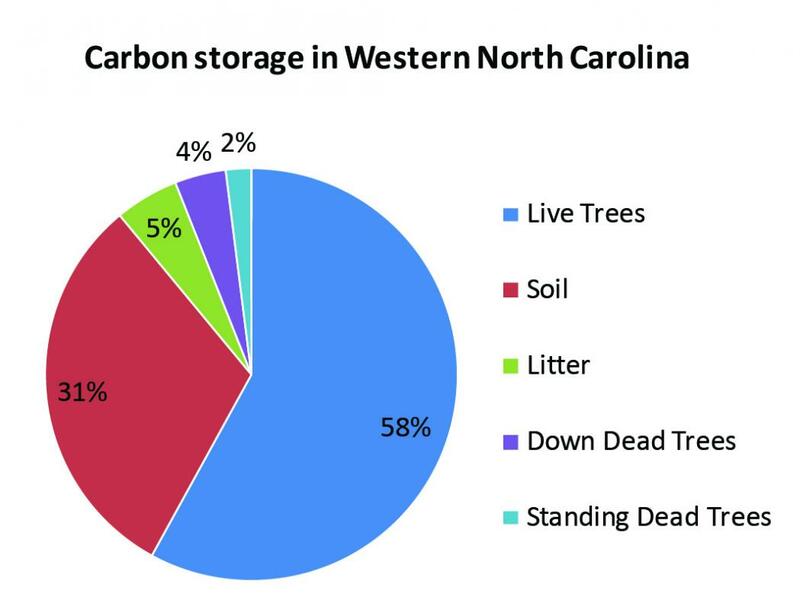 The forests of Western North Carolina currently represent a significant carbon pool, but in the future, carbon losses will almost certainly outpace carbon gains. Vose, J.M., and P. V. Bolstad, "Biotic and abiotic factors regulating forest floor CO2 flux across a range of forest age classes in the southern Appalachians," Pedobiologia, 50 (2007): 577–587. Haida climate forest, general information on trees, carbon and climate, 2007. Carbon Cycling and Sustanable Forestry: Forest Foundation, 2006, http://www.forestfoundation.org. Carbon Storage in Western North Carolina: UNC Asheville's NEMAC. Data source for this graph: USDA Forest Service, Southern Research Station, Forest Inventory Data Online (FIDO) EVALIDator 4.01 tool, http://apps.fs.fed.us/fia/fido/index.html.